We are known as one of the most sought after Manufacturers and Suppliers of the Countersunk Head Slot Machine Screws. 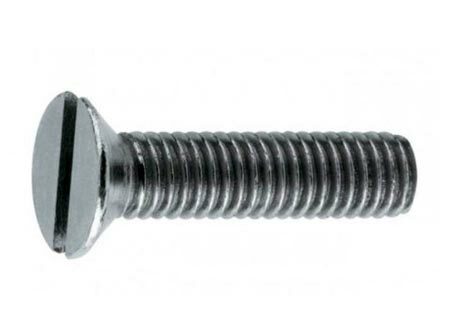 We fulfill the demands of various industries and sectors by presenting a huge gamut of Machine Screws and that too at the most competitive price. We capably make available the Countersunk Head Slot Machine Screws using sophisticated technology. We are capable of entertaining bulk requirements of the customers. Metric Countersunk Slot Machine Screws are made to DIN963 and available in 304 and 316 Grade. Imperial sizes of Countersunk Slot Machine Screws are also available in UNC and BSW thread patterns and in 304 and 316 grades, note UNC and BSW are interchangeable in all sizes except 1/2" and the angle of the countersink. Longer lengths with Countersunk Slot drive heads are also available as Track Bolts.